Oh Flip flops… Should We Banish you? Warm weather is going to arrive soon, and inevitably you’ll be seeing more patients wearing sandals and flip-flops into your office. Of all the harmful summer footwear out there, traditional flip-flops are perhaps the most damaging. 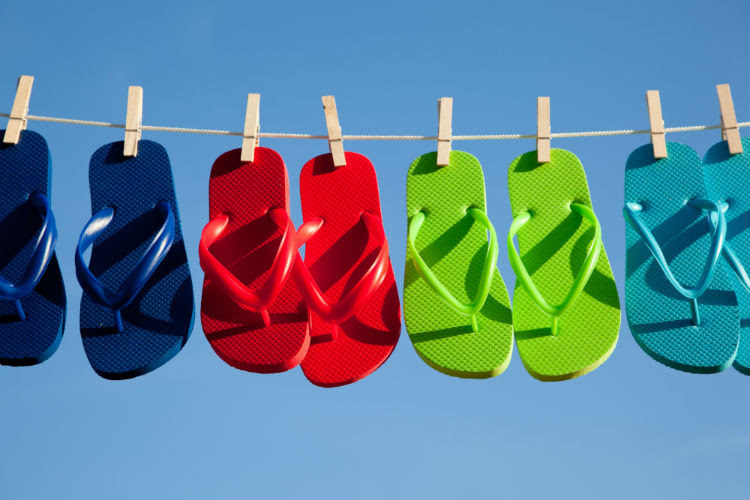 Traditional flip-flops are notoriously flat, offering little support or cushioning to the foot. Not surprisingly, reported rates of heel pain, frequently due to plantar fasciitis, statistically rise in the spring as flip-flop wearers shed their winter footwear in favor of the popular sandal. The problem worsens when the wearer is overweight or sedentary. Researchers at Auburn University found that wearing traditional flip-flops can alter gait, “which can result in problems and pain from the foot up into the hips and lower back,” according to biomechanics doctoral student Justin Schroyer, the study’s lead author. “Variations like this at the foot can result in changes up the kinetic chain, which in this case can extend upward in the wearer’s body,” Schroyer adds.